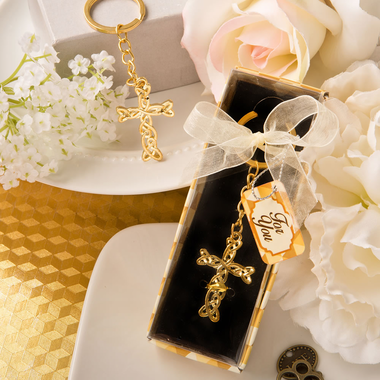 When planning to celebrate the blessing of any Christian event, our golden cross key ring is an affordable and elegant expression of your commitment to your faith. The elegant cross charm is of metal construction with a gold finish and is attached to a gold metal chain and keyring. Each cross measures 1.5" x 1" and with the chain is 3.5" long. Each comes in a gift box with a festive pattern box in tones of gold, black background inset and a clear plastic top. Each is finished with an ivory organza ribbon and a coordinating general use 'For You' tag.